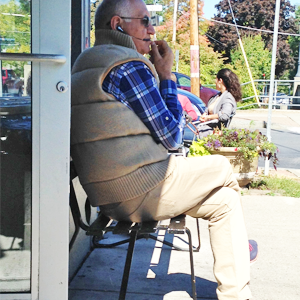 not-so-young person, but he was just as stylish as any of the young whippersnappers that surrounded him. The photo here doesn’t really do him justice, but just trust me. What caught my eye were his impeccable shoes…spotless, unique, blue-suede kicks with red laces and a beige sole. They matched perfectly with his plaid shirt, and accenting the nice camel shade of his trousers and nod-to-the-cripsy-autumnal-weather down vest. He was on the phone with someone, talking in another language. My guess was Greek, but after awhile I thought perhaps something else. Wherever he’s from, those people take their style seriously. My hat is off to you, foreign older gentleman. Many an American grandpa could get some much needed tips from you and your look.